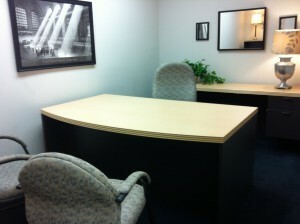 24/7 Access to Class A, private office with month-to-month agreements. One wired or access to wi-fi high speed Internet. One assigned monthly parking space within a block of the building. Utilities, maintenance, and daily housekeeping included. Membership with the private fine dining club on the 21st floor of our building. There are reciprocal clubs all over the U.S.
Executive level office furnishings or unfurnished. Live call management Monday through Friday 8:30 a.m.—5:00 p.m. with voicemail after hours and on holidays. Phone handsets with one or more phone lines. Business Concierge support available by the hour for general clerical projects and more.